CHINA: Dark Sword: China has a supersonic drone? Israel says it needs tougher tools to stop recent “lone wolf” attacks on Jews by Palestinians. But critics say the practice is strikingly at odds with basic notions of justice, fairness and legality in a democracy — and that it is bound to bring on more hatred rather than serve as a deterrent. How Obama dumped Hagel – Cabinet members come and go during a president’s administration. A two-term president’s cabinet is shuffled several times (usually). But the “pro-Obama” Corporate Media is relentless in building resentment toward a man who knew that he would be resented for his actions. It was part of the deal, so to speak. Obama is supposed to be the “failure president;” the Jimmy Carter of the early 21st century. He has lived up to the title. He has worked hard to earn it. His “friends” in the Corporate Media have helped stoke resentment since 2009. Obama is playing his part. Hagel is playing his. Everyone else with a stake in the matter is along for the ride. (VIDEO) Obama hands out Medal of Freedom to Hollywood actress – He claimed that the medals–America’s highest civilian honor–go to those who essential to the country. Clearly, this didn’t include Meryl Streep. But she was honored nevertheless. Actors are treated much differently in 21st century America than they have been treated throughout most of recorded history. Everyone on Capitol Hill gets ethics training–except for the House of Representatives – All who believe “ethics training” will turn the USA around, raise your hands. After all, it’s done so much for the U.S. Senate. FERGUSON: No indictment for police officer – There were a few things which stood out among all of the pleas by the various government officials for “peace” and “calm.” The announcement was made in such a way as to get maximum tension from the racial situation. 1- Instead of announcing the decision this morning or Tuesday morning, the officials allowed the tensions to build all day long. In fact, the time of the announcement was delayed an hour from the previously-announced 8 pm until 9 pm EST. 2- The prosecutors (who set the time of the grand jury verdict) made the UNUSUAL move to make the announcement after dark. This was so odd that USA Today even commented on the situation. For a government supposedly beside themselves with worry and concern, why delay the announcement until after dark? The events in Ferguson–like many situations which face Americans today–showcase officials who say one thing but whose actions declare something altogether different. ISIS: A CIA creation to justify war abroad and repression at home – Some good basic facts contained in this piece. The Origins of Aggressive Atheism – Atheists fulfill an important role in America. 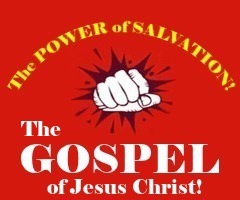 They deceive the unsaved apostates in the American Church into believing they are living righteous Christian lives. The MIcroaggression Farce – This is a very well-written piece. But whether a piece is well-written does not affect whether it is a media narratives or not. This piece details the railroading of a white professor at UCLA. Yes, the actions against the professor by UCLA were in no way fair or professional. BUT, the author of the piece wastes no opportunities to gather sympathy for the professor. No opportunity is missed to disparage the students–even though some occasions appear warranted. The fault lies totally with UCLA. Students will push the boundaries; the administration is supposed to firmly push back. UCLA railroaded this 79-year-old professor. There’s no two ways about it. Which is what this article does from the opening paragraph until the last. This is what your face looks like to Facebook – The software never sleeps. The Apostates are declaring that they are breaking their chains. The Bible warns of the lawlessness of the end times; that this time will be a time of no restraint; of casting off the cords of civilized society. Of rejecting the restraints placed on man’s evil heart by God and His Anointed, Jesus Christ. The apostate churches are excited. They believe the time of Jesus is past. The Age of Man (and the man of sin) is here. They will try and put their proclamations into another context naturally. But some no longer try to hide it. 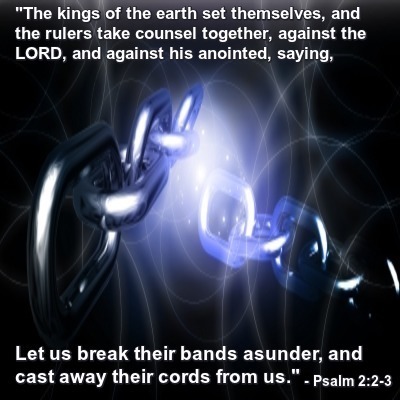 Whenever you hear someone proclaiming they are “breaking the chains,” they are fulfilling Psalm 2. Day by day, one can hear the chains falling. However, there is more to Psalm 2 than just the first three verses. God’s people DO pray. By definition, God’s people pray. IF they didn’t pray, they wouldn’t be God’s people. The Best Science Books Of 2014 – Outside of politics, no field produces so many entertaining narratives as science. Doing Heroin with my dad – Most humans tell themselves a wide variety of little lies and fairy tales in order to make their way easier as they move through life. This is a particularly sad collection of such fables. It’s amazing the many ways man will attempt to repair the holes opened up by sin.